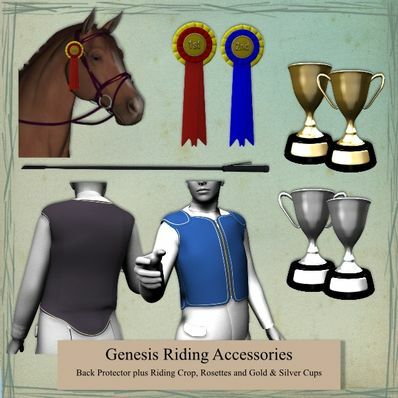 Riding Accessories for Genesis for use in Daz Studio 4. Thank you so much. I have the perfect situation in mind for this riding crop! Well done! I appreciate your work! thx a lot! nice! thank you soooo much! This will really add to my horse renders! Thank you. Very useful items. Thank you. Not sure how you feel about requests, but one thing I have been unable to find anywhere are Olympics style medals, not just for equestrian but for all the genesis athletes standing on the podium.